If you have an armful of new fashion dress shirts that have Italian style and design going for them, chances are that some of them may have the Daniel Ellissa label sewn in the neck. That is because when it comes to fashion dress shirts for men, Daniel Ellissa knows that style counts. 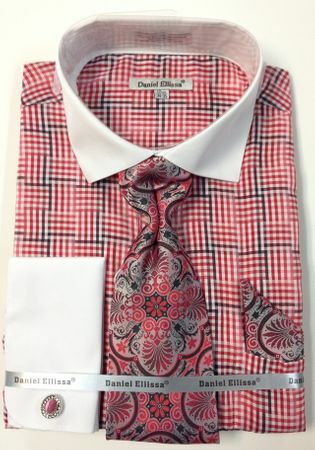 This red color shirt features a cross plaid design that comes with the matching tie and hanky set for complete Italian designed look. Made of cotton/poly fabric.